CU-Baby Chicks & Chickens: How Do I Start Baby Chicks? The first important aspect in a chickens like is when it hatches. Hatching, is a great obstacle a developing chick faces to come into the world. It is a very tiresome and exhausting process. The chicks first pips a hole in the large end of the egg, then continues cracking it as they turn themselves around inside the egg. This part of the hatch is called zipping, and once it’s done, the chick now needs to push itself out of the egg, using all of the strength that he has got left in him. Once they are out, extremely exhausted, they fall asleep. They have overcome the first challenge in their little chicken lives. Within four hours since they have hatched, the chick will be dry, fluffy, and ready to come out of the incubator, and into the brooder. But at least 48 hours prior to hatching, the brooder must be set up.If you don't already know, a brooder is a the place where the chicks will spends the first few weeks of their lives. The brooder is meant to mimic the mother hen, by keeping the chicks warm and secure. It is also advised to use a infrared bulb for the heat lamp. 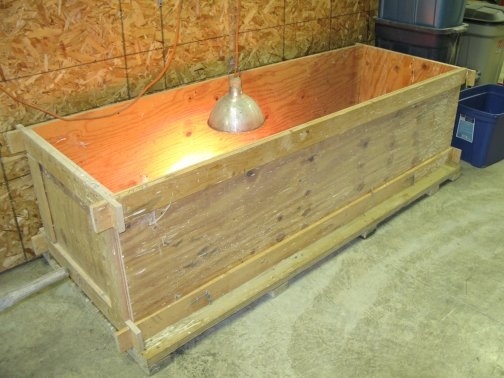 This will produce a nice red and warm glow, that will give the chicks enough light for them to see, and not blinding them with a bright white light. White light, may also overstimulate the birds, causing them to become restless and noisy. It can also lead them to start picking each other, then eventually cannibalism. The nice, calm red glow of an infrared bulb does not overstimulate the chicks, it's not too dark for them to see, and it's not too light for them to be rowdy, it's just right, and is used by many breeders to help prevent pecking and cannibalism in their newly hatched flock. 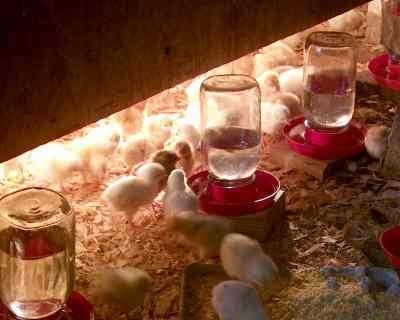 When placing the feeders and waterers in the brooder, it is best to distribute them around so the chicks have to exercise a bit to get what they need, but it should still be fairly close to the heat lamp. The waterers should be nearer to the heat lamp, because the chicks will not want to drink it cold, and cold water also discourages drinking. If the waterers are too close, or right beneath the heat lamp, the water will start to get slimy because of all the dust and litter that gets into it, and the chicks will not want to drink it. The feeders can pretty much go wherever, as long as they are not to far from where the heat lamp is. It is best to block of any corners in the brooder with a piece of cardboard, because chicks like to huddle together, and can suffocate each other if the can get into tight corners. It is also advised to put pebbles or marbles in the chick waterer. This is to prevent the chicks from drowning. Sawdust should not be used as bedding, for at least the first week, because young chicks cannot tell the difference between it, and food, and will eat it causing them to have things like pasty but etc. Once the baby chicks have dried, and are completely fluffy, you can then take them out of the incubator and place them in the brooder. Right before you set him down on the brooder floor, hold him in one hand, and take him to the waterer. With a finger on your other hand, dunk his little head in the water. This is to show him where the water is, and how to drink it. Do this with every chick before placing them in the brooder. With the food, take them to the feeder, and "peck" at the food with your fingers, and they will get curious, and peck it, and learn to eat. 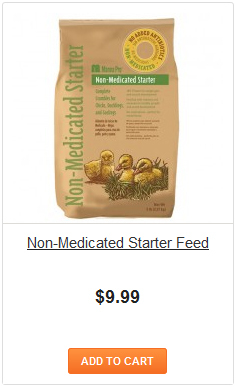 Remember, they should only be fed chick starter, or chick mash. If you ever run out, you can also feed them crumbled up hard boiled egg. Right after you are done showing them how to eat/drink, place them directly under the heat lamp, so they know where the source of heat is. 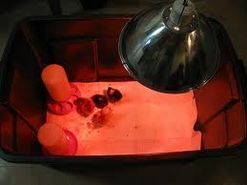 Make sure that you have left the heat lamp on a few hours before you put the chicks in, this is so the spot under the heat lamp has a chance to warm up, and the chicks can tell easily where the warm part of the brooder is. It is said, to higher the heat lamp so the temperature goes down 5 degrees per week, because, as the chicks grow, they will be needing less and less heat. But your best bet on how your chicks are doing temperature wise, is the chicks themselves. If you see the chicks huddled closely beneath the heat lamp cheeping loudly, it is too cold, and the heat lamp must be lowered closer to them. 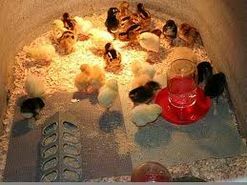 If the chicks are chicks make a circle around where the warm spot of the heat lamp is, like a doughnut, they are too hot. If they are all dispersed as far away from the heat lamp as they can go, and are pushing themselves against the wall of the brooder, panting, they are way too hot, and the heat lamp should be risen higher to lower the temperature immediately. If there are some chicks near to the heat lamp, and some wandering around, not piling on each other, and relatively quiet, the temperature is just right. Once the chicks are old enough, or at least fully feathered, it's time for you to move them outside. Some people like to have them in a tractor, until they are old enough to putt them with the older chickens. If you have a coop already built for them, put them in, but make sure that the chicken door that leads to the run is closed. They need to be locked in the coop for at least a week, so they know where to sleep and get used to the idea that the coop is their home, so when you do let them out, they will come into the coop at dusk to sleep without you having to herd them in. If you want to mix them in with the older hens, have the chicks in a little chicken tractor(or separate pen)just outside the older flocks run, when they are old enough to be outside. 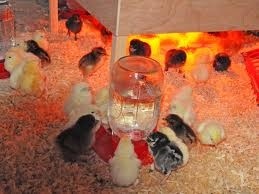 You can put your chicks outside when they are about 3 or 4 weeks old, but they still might need a heat lamp. So they will be in there, growing up beside your older flock, until they are two months old. The older flock will get used to the chicks presence there, and this will help them to get to know each other a little before you mix them in. Once the chicks are 2 months old, or stop making baby chick noises, you may put them in with the older flock at dusk by setting them on the roosts. Adding chickens to an already existing flock will trigger the reinstatement of the pecking order. The adolescent chicks will most likely not even put up a fight with the older chickens. Although the chicks will be very submissive, and run away when an older hen comes near, not being aggressive makes them easy to get along with the older hens over a period of time. Two months is kind of the sweet spot to integrate young chickens with the older flock. If the chicks are too small, the older chickens will kill them, and if the chicks are already full grown, the older chickens will kill them. They wont necessarily "kill" the full grown chicks, but they will fight allot, and this sometimes results in death of a younger chicken. At two months old, they are not too vulnerable, and they are not to feisty, so fighting or death should not be a problem. Baby chicks require constant care and monitoring, so make sure your schedule is clear for the first 4 weeks! Don't plan on vacations or even day trips unless you have a seasoned baby chick pro on standby. Make sure you or a member of your family are available to check on them at least 5 times a day. Ideally you'll have a garage, workshop, basement or another predator-proof and draft-proof environment that's not in your main living space. Why not the main living space? Baby chicks, just like grown chickens, love to "scratch" their bedding materials, which creates a very fine dust that gets everywhere. The older they get, the more dust they make. Baby chicks also have a smell... It's not decidedly bad, nor do we find it overwhelming, but you may not want it in your house. Baby chicks need to be protected from drafts but still have adequate ventilation. This can be in the form of a cardboard box with holes for ventilation, a single-faced corrugated cardboard roll, 12" or higher, a large plastic storage bin, or even a kiddie pool! All of the above have been used with success. Baby chicks need to be kept pretty hot. Think sauna! The first week of their lives they require an air temperature of 95 degrees, the second week 90 degrees, and so on - going down by 5 degrees per week until they're ready to transition to "outside". A 250-watt infrared heat lamp is the best way to achieve this, placed right in the middle of their living area and suspended off the ground. The height of the light will depend on what it takes to achieve your target temperature. We recommend a red heat bulb for a few reasons: one, with a bright white light constantly glaring it can be hard for them to sleep. The red light is darker and provides them some respite. Two, red lights help prevent them from pecking one another. We sell both red and white heat bulbs plus the brooder lamps. Pay close attention to how your chicks behave. If they're all crowded together directly under the heat source, they're cold. Lower the heat lamp or add another one. 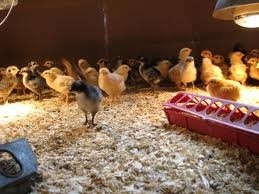 If they're around the edges of the brooder, avoiding the heat and each other like the plague, they're too hot! Raise the heat lamp. A happy flock will happily be exploring all around the brooder. And please do not listen to anyone that tells you a regular old 60 watt bulb will suffice! We've seen chicks die from this bad advice. They really need a lamp intended to produce heat, and as we've mentioned, we recommend the 250-watt variety. We recommend you don't try to use a dish, a rabbit drinker, or anything you have just "laying around". Baby chicks have special needs when it comes to water. Dishes can make it easy for chicks to drown, and they'll certainly do naughty things likwe walk in it, spill it, kick their bedding materials into it, and poop in it -- meaning you'll have to change it constatly. Rabbit drinkers aren't preferable, either, becuase not enough chicks can access it at once. 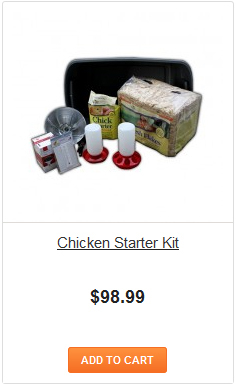 For the best results, we recommend you use a chick waterer. They come in a number of different sizes and shapes, all basically sufficient. Keep in mind that even with the best drinker, they'll still kick bedding materials into it and find ways to poop in it from time to time. Raising the waterer off the ground somewhat will help (starting their second week of life), but no matter what they're going to get that water messy, so plan on changing it a few times a day. Once again, we recommend you resist the temptation to use a dish or bowl for feeding your chicks. They're messy, and they'll jump in and kick the feed all over the place, poop in it, and worse case scenario: they'll tip it over and trap a baby underneath. (This has happened!) 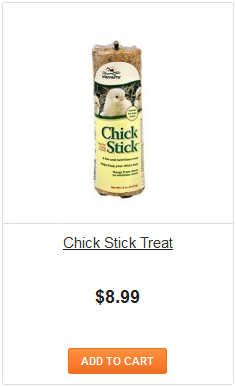 Spend those few extra dollars and buy a "real" baby chick feeder, or borrow one from a friend. They come in many shapes and sizes, and we offer the very baby chick feeder we use for our chicks. As you move your baby chicks from their shipping box into their brooder kit (which you've set up and heated in advance, of course! ), check them for "pasting up", a condition in which their droppings cake up and block their vent opening, preventing them from passing any more droppings. This problem will be pretty obvious; you won't have to go poking around their insides to see it. The dried poo will be stuck to their outside, totally or partially covering their vent. This is a deadly condition and must be resolved with immediately. 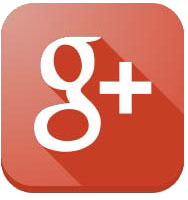 We recommend you apply a warm, wet paper towel to their rears and then use a toothpick to clear the blockage. In especially bad cases you may have to dunk the chick's rear in warm water before it will loosen up enough to remove it. Your chick will complain, loudly, but stand fast in your determination knowing that the chick will die if you don't! Then, dry the chick off with a blow dryer and immediately return her to the brooder kit with the others. And keep checking the birds that presented with this problem, for it often returns throughout the first week. Q: Can I combine different breeds in a flock, or will they not get along? A: Go ahead and combine! No matter what combo of birds you get -- whether it's 25 of the same breed or one each of five different breeds -- one bird will be at the top of the pecking order and one will be at the bottom. This is true whether you get aggressive birds (like Old English Games) or really docile birds (like Silkies). You'll have a "head honcho" that "rules the roost" and a "wallflower" that stays out of the fray for fear she'll get picked on by the others. Also, even if you order purely docile breeds, you could have one with a wacky personality that picks on all the others, or vice versa a reputedly "flighty" breed could end up being your biggest sweetheart! In other words, each bird has their own, unique personality. So don't worry too much about managing your flock. Just go with what you like! Q: Can I combine bantams and large fowl (standard) birds together? A: See above. Same goes here! Q: How much food should I give my baby chicks? A: As much as they want! We talked about this a little above, but in case you didn't catch it, chickens aren't like dogs -- they won't eat themselves to death. They'll only eat as much as they need. So go on, spoil them! Give them as much food as you can fit in your feeder. They won't overdo it. Q: Is "pasting up" REALLY a deadly condition? A: You bet it is! "Pasting up" is described above: it's when droppings cake up and block a baby chick's vent opening, preventing them from passing any more droppings, and it must be dealt with imediately. Apply a warm, wet paper towel to their rears and then use a toothpick to gently clear the blockage, or in severe cases dunk the chick's rear in warm water so it softens up enough to remove it. Dry her off and return her to the brooder kit with the other chicks, and keep an eye on her in the coming days to make sure the problem doesn't return.